Excited for this invitation to Young Women's Leadership Connection (YWLC) upcoming celebration of International Women's Day this Friday Evening 22nd March 2013 ! Been wanting to share with you all about this invitation but I got so busy with work and I forgot. But the great news is! 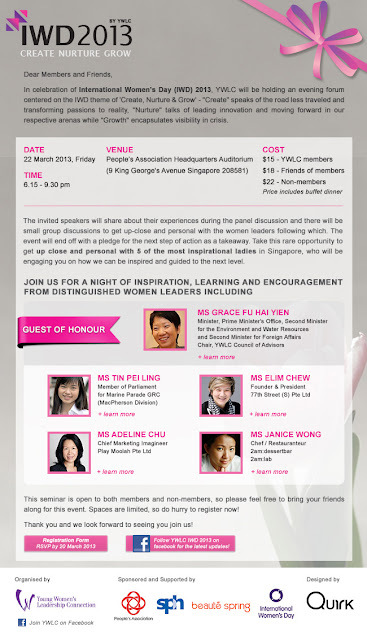 YWLC had decide to extend the registration to 21st March 2013 midnight 00:00 so there's still opportunity for those interested to hear from these 5 wonderful women speakers. Personally for me , I'm always interested in hearing from women leaders because their experience reminds me that indeed no matter how successful one is, its important to give back to the community, its always important to innovate to stay in the market and most importantly, humility and always continue learning from others. And the unique point about a leader, is that she stands up when she is hit and not wallow in self-disappointment. Its the attitude and its the support. The world have been changing so fast with globalization and suddenly this year I realize I'm part of the generation who have gone through from no way of communication, to pagers, to hand phones and now to android phones. In the past, we rarely use the computer, then suddenly we are on the computer for chats MIRC and ICQ ( I still remember the sound when messages come in), and now computer for everything we do. - That sometimes we can't think when we are faced with a paper and pen. And these events provides an opportunity for reflection and also to ask for advice in guiding us to a clearer career direction. The Young Women's Leadership Connection (YWLC) was founded by Mrs. Lim Hwee Hua, Former Singapore Minister (Prime Minister's Office) and Second Minister for Finance and Transport, and UBS Singapore in 2008, in an effort to create a pipeline of women leaders and more opportunities for young women with leadership potential in Singapore. YWLC seeks to empower and groom the young women leaders of Singapore through the following 4 core pillars – Leadership Development, Networking, Mentorship and Community Engagement. 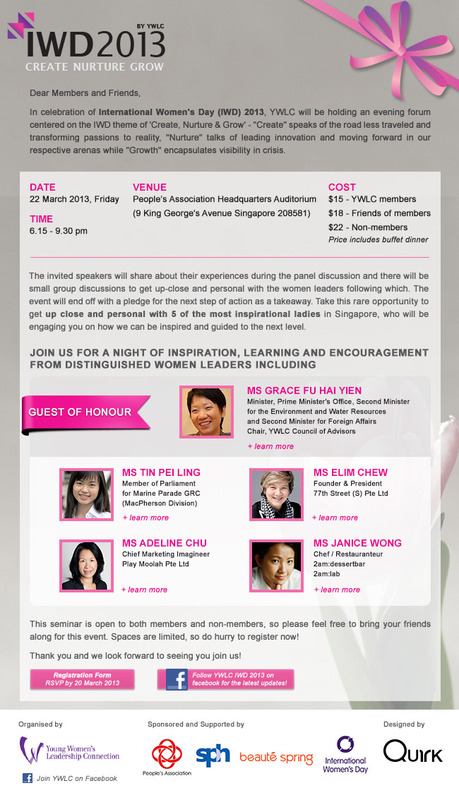 Find out more about YWLC at www.ywlc.org.sg or join our Facebook Fanpage at www.facebook.com/ywlcsingapore .